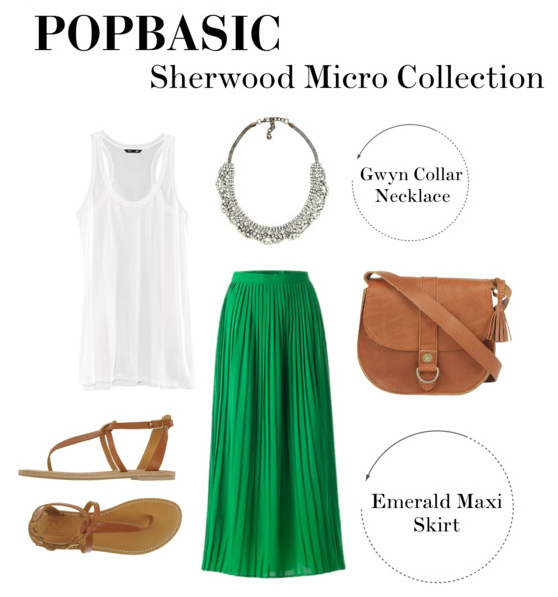 After reading Hayerlily's post about Popbasic's Sherwood Micro Collection which is due to be released soon, I was inspired to head over to Polyvore and have a go at styling the pieces myself! The first look I came up was based around the Grey Marl T-shirt. As the piece itself is quite simple, I didn't want to make the overall look too busy and detract attention away from the t-shirt, so I stuck to a fairly neutral colour scheme of greys and blacks, with a subtle pop of colour in the form of Rimmel's Lycra Pro nail polish (which is now called Salon Pro) in Peppermint, which is a lovely muted mint colour, perfect for spring. I paired the shirt with these DIESEL leather jeans, as I felt their texture would contrast well with the t-shirt's marl pattern and would add a bit of an edge to the outfit. The studded Zara bag also brings a bit of toughness to the look. I kept the jewellery very simple with this Dogeared Karma necklace, and I added the slouchy American Vintage cardigan to contrast with the tight leather jeans and create a more interesting silhouette, as well as to prepare for the unpredictable British spring weather. I was unsure about what sort of shoe to add to this, but in the end I settled for a pair of simple Nelly loafers as they make the outfit a little more casual and they match the comfy feel of the cardigan. This look would be ideal for a lunch date or a day out. 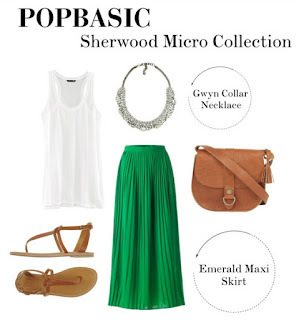 The second look I came up with was based around the Emerald Green Maxi Skirt and the Gwyn Collar Necklace. This look is a more suited for the warmer months and is a little more dressy, making it ideal for those summer evenings. Again I kept things fairly simple, which is very important when you're working with a piece as beautiful and intricate as the Gwyn Collar Necklace. I opted for a plain H&M white tank on top which I would tuck loosely into the skirt to create a nice, relaxed silhouette. The baggy top and flowy skirt will not only look effortlessly stylish, but they will keep you cool when the weather gets warmer. I chose the tan sandals and Fatface bag as they compliment the colour of the skirt perfectly, and they keep the outfit looking summery and light. I am a die hard lover of bracelets and rings, but as the collar necklace is so striking, I felt that adding more jewellery would be an overload, so I decided to let the necklace do all the talking. Check out Popbasic's website to find out more about their clothing, and be sure to sign up to find out when the collection is going to be released. You can also click here to see what other people have been doing with the items on Polyvore! Thank you for sharing your useful ideas. I can testify that all the planning and decision-making can be really challenging.Regarding other tips: keep your sense of humor. Do whatever it takes to laugh together and don't focus on perfection.This is attribute to I bought long sleeve white maxi dress.